For your 10 year anniversary, give her a gift that will have other women a little green with envy! 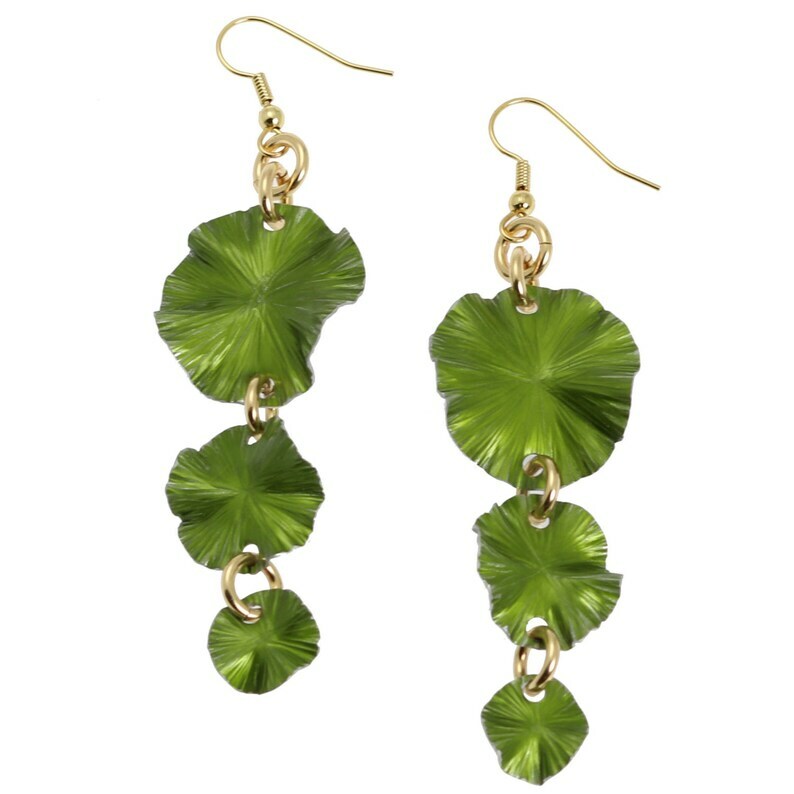 The John S. Brana Lime Anodized Aluminum Lily Pad Chandelier Earrings make a distinctive fashion statement with their vibrant green color and naturalistic lily pad-shaped discs. The chandelier earrings are great for dressing up casual ensembles and look equally as fashionable by night, making this one of those gift ideas for your 10th wedding anniversary that she can wear again and again. Made from aluminum metal, the discs allow the earrings to fit the aluminum anniversary gift tradition with a look that's a bit different than the usual silver-tone of aluminum. Made entirely by hand, the John S. Brana Lime Anodized Aluminum Lily Pad Chandelier Earrings will last a lifetime. The color is a permanent part of the metal that won't fade or wear off with time. Packaged in a gift box, the earrings are 3 inches long by 1 inch wide and feature 14-karat gold-filled jump rings and ear wires. Large Lime Anodized Aluminum Lily Pad Earrings - Green Leaf Earrings - Green Drop Earrings - Makes a Cool 10th Wedding Anniversary Gift! Lime Anodized Aluminum Lily Pad Earrings - Green Leaf Earrings - Green Drop Earrings - Makes a Cool 10th Wedding Anniversary Gift!